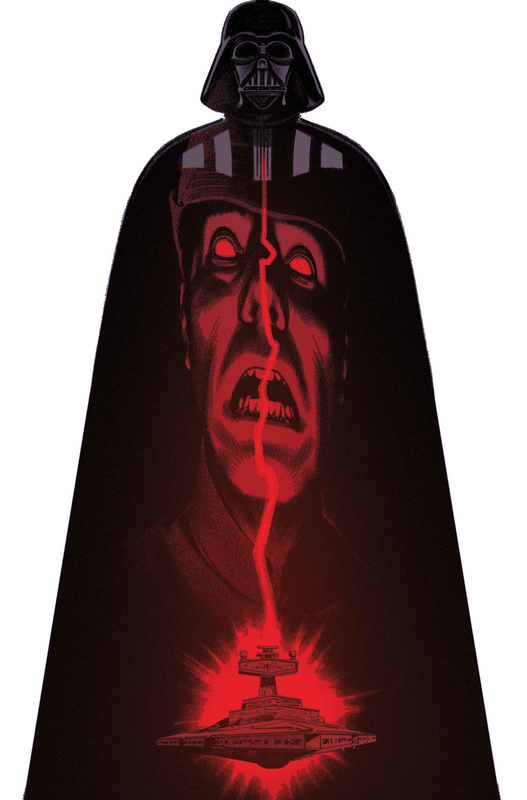 Vader – Dark Visions #2 follows the doomed decisions of a desperate and stupid Imperial commander who cases after an escaped Rebel spy. I’ll be honest, I didn’t like this one. The art didn’t work for me and neither did the story. The issue opens with a Rebel outrunning an Imperial Fleet with his U-Wing. He escapes, and the Imperial commander is furious. His subordinate lets him know that is wasn’t a complete loss as they destroyed a rebel base and gained some intel, so they try to spin it as a victory. However, Vader follows up and wants to talk with the Rebel spy…who they don’t actually have in their custody. It’s a bit of a plot hole and we’re left to assume the commander got carried away in the story he spun and for some reason lied and said they had the spy. Once he hears that Vader is coming, he freaks out as he has seen what Vader does to those who fail him. So they chase after the Rebel spy and miraculously find him. But the spy dives down to a nearby planet and hides in a sand storm. The Imp commander foolishly sens all of his TIE fighters after the Rebel, and they all get destroyed. The U-Wing then flies into a space slug, which is actually pretty cool and the only good thing in this issue. The Star Destroyer actually follows the U-Wing into the space slug and they both rip out the side of it. Unfortunately, things go worse from there and the Imperials are eventually wiped out. They try to flee and the commander is hunted down and killed by Vader. As is, the story is kind of lame. I know that’s harsh, but that’s honestly the first word I thought of when I was done. I’m not saying everyone is going to hate this comic, but it didn’t work for me. Watching an Imperial commander make dumber and dumber decisions as he’s ruled by his fear of Vader was not entertaining. Coupled with the weak story was the weak artwork. The style is a bit cartoony and silly and looks like something you’d see in IDW’s Star Wars Adventures comics. However, this isn’t a kiddy story as it gets quite violent. The facial expressions of the commander are rather exaggerated, and the style just didn’t appeal to me. That said, I did like some of the inventiveness with the panel arrangements and how some of them were in the shapes of things like the space slug or a Star Destroyer. The space slug also looked really good. With artwork and a story that both let me down, I give this one a two out of five metal bikinis. I’d give it a one, but I liked the space slug chase part, so I’m bumping it up because of that.